Ozu"- Little Kyoto" SUBPAGE | All Japan Kyoto Association"
Ozu prospered as the castle town of the Kato Family. This castle town was nurtured by the pure waters of the Hiji River and it still preserves the atmosphere of the good old days of the Edo period (1603-1868) to Meiji period (1868-1912). At some sections of the castle, where the Shikkui white plaster walls have fallen off to expose the earthen wall underneath, visitors will be reminded of the passage of time. In wintertime, the “Hijikawa Arashi” morning mist transforms the city into an even more beautiful little Kyoto. 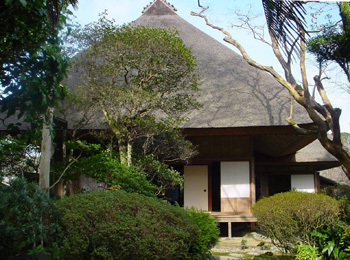 The villa stands on an approximately 9,900 square meters of land from where one can observe the most famous scenic place along the Hiji River, “Garyu-no-Fuchi” pond. Garyu-in, Furo-an and Chishi-an are prominent architectural structures built with highly skilled techniques featuring elegant decorations. These buildings reflect the varying beauty of each season, the Japanese lifestyle and the way of tea. 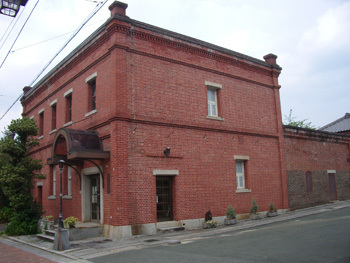 This building was originally built as the Ozu Bank of Commerce in December, 1901. The architecture features both Japanese and western styles consisting of a red-brick British structure with a Japanese tiled roof. It is now used as the tourist facility for selling and displaying local foods and goods. 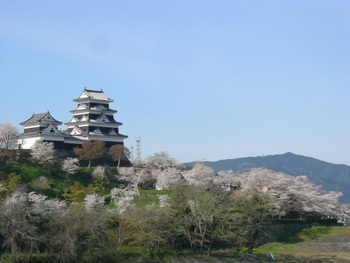 This castle has a four-story, four-layered castle tower and was reconstructed in 2004 based on an old photo from the Meiji period (1868-1912) and documents which specify the castle tower wooden structured model called “Tenshu Hinagata” from the Edo period (1600-1868). Four existing Yagura guard watch towers were designated as an important cultural property. 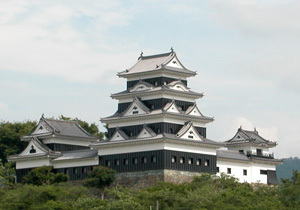 The castle ruin was designated as an historic site by Ehime Prefecture. The height of the castle tower, 19.15 meters, is the tallest in Japan amongst wooden buildings that were reconstructed after the WW II. This is the street where NHK’s morning drama “Ohanahan” was filmed. The TV drama’s shooting related panels are displayed at a resting spot on Ohanahan Street. Lined with traditional houses from the Meiji period (1868-1912), it was used as a center of commerce. 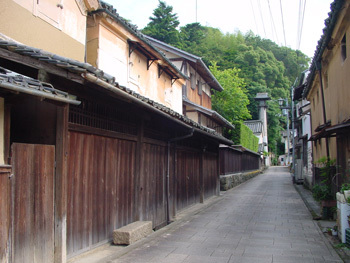 The town’s peculiar Namako walls on both sides and storehouses with panels attached underneath produce a beautiful Meiji period townscape along with Oahanhan Street itself. This is a fun alley with a market reproducing the good old days of shops and entertainment from the 1960’s. 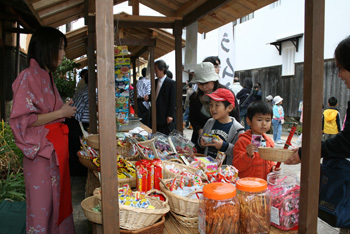 Antiques, snacks and sweets, soda, auto tricycles, retrospect advertising and much more are displayed. At Omoide Soko, the Showa period’s scenery is reproduced right in front of you: a pharmacy, theater, police office, barber and living room from that time are all on show. 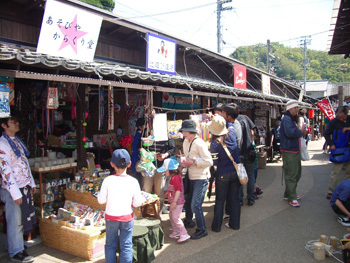 Many stalls selling lucky items such as Fukuzasa bamboo decorations, Kumade bear -hand-shaped decorations and wooden box-shaped Masu, line the approach. 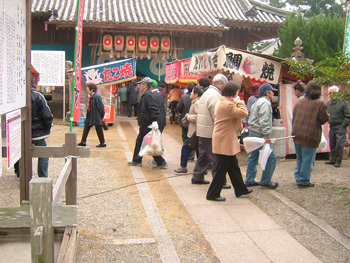 On the Hon Ebisu Festival day on the 10th, many people visit the shrine to participate in the lucky Mochi rice cake draw, in which the winner is given a Tai sea bream. “To-ka Ebisu” will be held to pray for business success, family well-being and a rich harvest. 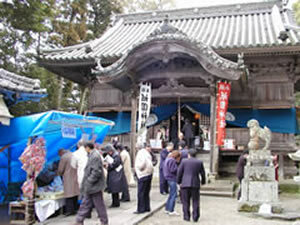 The festival is held to pray for good luck during the year. Many people visit these popular cherry blossom viewing sites: 200 Somei Yoshino cherry trees in Shiroyama Park, 3,000 Somei Yoshino cherry trees in Tomisuyama Park, 700 Yae cherry trees in Gion Park. Shiroyama Park and Hataki Gion Park are illuminated after dark, enabling visitors to enjoy a wonderful nighttime cherry viewing party. This is one of the popular azalea parks in western Japan displaying Kirishima azalea and some 60,000 azalea flowers blooming around the end of April to the early May. The top of Mt. 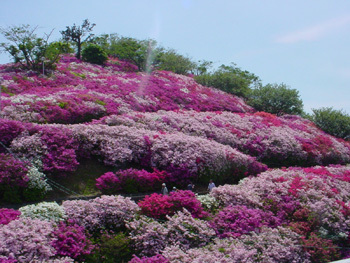 Fuji will be decorated with the red, white and pink colors of azalea flowers like a beautifully colored carpet. There is an observatory tower and souvenir shops. Traffic regulations are in force and parking will be charged during the azalea season. In the watershed of Yaochi River in the Yanagisawa area, Genji Botaru fireflies can be found in abundance and have been designated as a protected species of Ehime Prefecture. 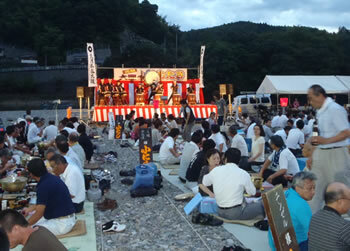 Many local events will be held during the festival period. 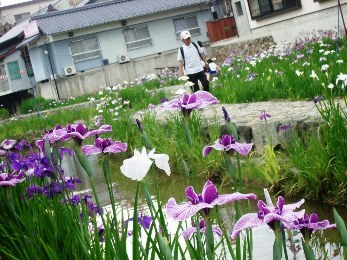 In Shobu Iris Park, about 5,000 irises of 200 varieties will reach full bloom. The Shobu Iris castle, built using layered iris flowers, is a must-see. The Ukai cormorant fishing in Ozu is regarded as one of the three grand Ukai in Japan. Many tourists visit the water town of Ozu and enjoy the elegant view from a boat and savor the river fish cuisine. 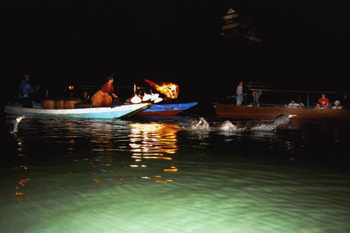 As the night darkness thickens, the red torched ukai boat appears and then both Yakata and Ukai boats run on the water’s surface side by side. At this Ukai, audiences are able to observe cormorants from close up. Enjoy the mystic night in Ozu. This firework festival has been held every year since 1948. 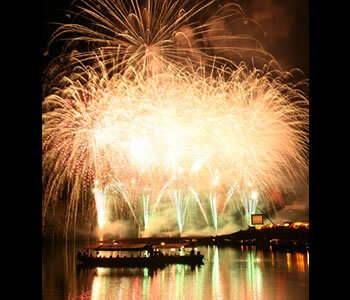 Various kinds of special fireworks, including sky rockets, Niagara fireworks and aquatic fireworks will beautifully illuminate the night sky of Ozu. Because Ozu is surrounded by mountains, the deep vibration of the grand firework’s burst can be enjoyed. Imotaki in Ozu has been passed down for over 300 years since the Hansei Tokugawa period. It is a traditional custom to savor the Ozu specialty mouth melting Satoimo taro potato cooked in pots along the riverbank. Straw mats are laid out along the Hiji River, and people gather to share the festive event while enjoying the beautiful lit up Garyu Ssanso Villa and feeling the gentle breeze under a night sky. 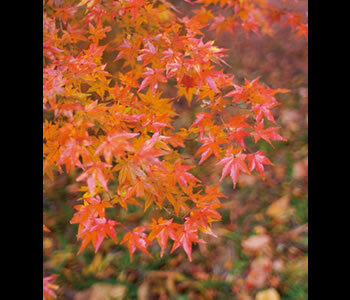 About 3,000 trees, including a 200-year-old Kaede maple tree turn colorful in autumn. During the Momiji Festival period from November 1st to 30th, many stalls will be lined up at Inariyama Park and the area surrounding the shrine will be beautifully transformed. In Shirataki Park, along the path, countless waterfalls and maple leaves harmonize into a scene of classic beauty. This is the biggest autumn festival in Ozu with a parade of Daimyo feudal lords and a traditional music band. Local performing arts and various events are scheduled. A small ferry is operated only on this day crossing to and from between the shores of the Hiji River. 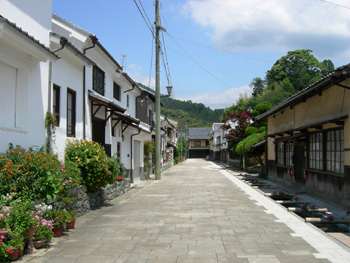 In the Konan area, the Roman-sai Festival is held reproducing the townscape in the olden days of the 1930’s and many markets and stalls will line the streets. A Takahari Chochin paper lantern which is hung under eaves at festivals and enshrined at shrines, is designated a traditional craft of Ehime Prefecture. At present, this chochin is the only product designated as a traditional craft in Ozu. Along with the Takahari Chochin, a shop owner as well as an artisan of the Hirajiya Kasa Chochin shop was designated as a traditional craftsman by Ehime Prefecture. Discover the beauty and strength of bamboo crafts in Ozu which are made using highly skilled techniques. Kumade is one of the lucky bamboo crafts that uses old techniques inherited from the traditional local industry. Imotaki in Ozu has been passed down for over 300 years since the Hansei Tokugawa period. It is a traditional custom to savor the Ozu specialty mouth melting Satoimo taro potato cooked in a pot at the riverbank. Straw mats are laid out along the Hiji River, and people gather to share the festive event while enjoying the beautiful lit up Garyu Ssanso Villa and feeling the gentle breeze under a night sky. 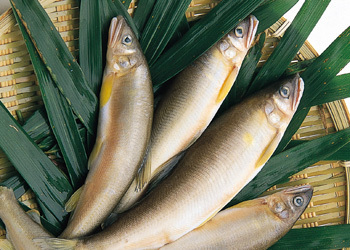 Ayu sweet fish and river crab from the Hiji River has a simple taste. Especially, ayu was used as a tribute to the shogun during the Hansei Tokugawa period. To add flavor, mugi barley miso is grilled, and put into a cold dashi broth. 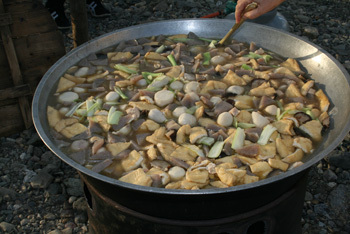 Then, flaked fish is added into the broth and warm rice is poured over it. This is a traditional cuisine of Ozu. When Ozu domain was staying at Edo, this Shigure recipe was passed down as a family-secret confectionery. It uses azuki beans from Hokkaido and is mixed with mochi powder, rice powder and sugar. The dough is then steamed following the old style. It has a sticky texture with a light taste. This traditional confectionery shop has been operating for over 370 years since its opening in 1624 and the shop used to be a purveyor to the Ozu family. This is a Japanese Wagashi sweet in which Koshian smooth bean paste is wrapped in Warabi-mochi, then Kinako powdered soybean is sprinkled on. When eating, the soft texture touches the tongue and warabi-mochi and bean paste melt all together. It will bring you an unforgettable taste and you will feel like eating more and more.